Chicken Pot Stool. No, that's not it. It’s a new year for the soup blog. And a new beginning for my weekly go-round of soup recipes. Because frankly, after having made a new soup every seven days for the past year, I’m a bit bored. That, and my family is rebelling against all this forced soup consumption. Something classic. That’s why I reached into the soup aisle at the local supermarket and stole a soup from Campbell’s. A little something called Chicken and Rice soup. A soup which brings us right back to where I started one year ago. Okay, that was chicken noodle soup, but really, what’s the difference? And I don’t mean the difference between noodles and rice, I’ve go that one pretty well figured out, smart guy. The difference is that whereas many of my soups from the past year began as classic dishes before I translated them to the soup pot, this dish began as an (ahem) classic soup that I translated back into an entrée. All right, if you don’t think that Chicken and Rice soup qualifies as a classic, I’m not going to disagree with you. My family never had it when I was growing up. We never even had Chicken with Stars, which, I imagine is the “kid-friendly” version of Campbell’s Chicken Noodle which was pretty darned kid friendly to begin with. Not that I went the pedestrian route to my chicken and rice soup. I used brown rice. Pretty high brow, huh? Perhaps I even used too much of it. Why not? I’ve had bags of the stuff lining the bottom of my refrigerator for months. The result was a very thick soup, partly because brown rice absorbs a fair amount of water, and partly because of the lengthy simmering process I went through to soften up said brown rice. And that’s when I got my big idea. Forget about the soup and go for something more substantial. A little bit of roux, a nice batch of pie crust dough, and thirty minutes in a 400°F oven later, I had a delicious and very filling Chicken Pot Pie. I’m not sure how fertile this new conceit of converting soups into entrees will be. Maybe I’ve tapped it out already. Who knows? The only thing you can count on is that I’ll be back again next week. Add the onion, carrots, celery, chicken, rice parsley stock and milk to a 5 quart soup pot. Bring to a boil, then reduce to a simmer for about an hour. As the soup is simmering, melt the butter in a pan, stir in the flour until fully combined and cook over low heat until it takes on a blonde color (6-8 minutes). This is called a blonde roux. In a food processor, combine flour, sugar and salt, pulsing a few times to blend the dry ingredients. Cut butter into small pieces and add to the food processor along with the shortening. Pulse the processor several times until the dough starts to come together. Add ice water and process the dough further until it is pretty well combined. Empty dough out onto a floured board, roll into a ball, wrap in plastic, and refrigerate for at least ½ hour. Add the roux to the soup and continue cooking for another 20 minutes to allow the roux to absorb the liquid and thicken the soup. (can do this last the next day, if you’d like) Remove the dough from refrigerator and cut it into two pieces. Roll the first piece out into a circular shape and place along the bottom of a deep pie pan, casserole or spring form pan. Ladle the chicken and rice filling over the bottom of the crust until it almost reaches the top of the dough. NOTE: You will have a fair amount of filling left over. Make another pie if you’ like. Roll the second half of the dough into a round and place it over the top of the filling, taking care to tuck the dough around the outside of the bottom layer of dough so the pot pie filling is sealed in. Brush top layer of dough with beaten egg mixture. Place pie in a 400°F oven and bake for about 30 minutes. May serve immediately or reheat in the oven later for service. It ain’t soup, but it’s really good. 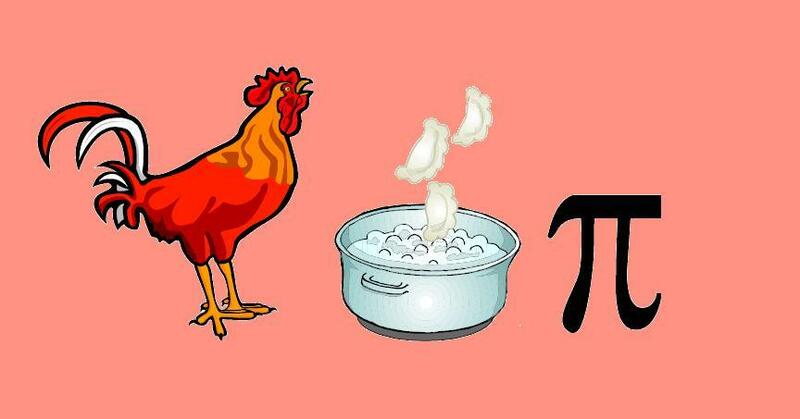 Image Credit: “Chicken Pot Pie” Another ClipArt rebus by the author. Is this still a soup blog if I’m converting my soup into entrees. I don’t see why not. If you disagree, please compile your thoughts and supporting logic into a nicely worded comment. I’d sure appreciate it.